SMS on a Sunday, for once! My first on time SMS post in weeks. I’m so proud! I’m going to keep this one short but sweet as I’m so exhausted I could just lay my head upon my laptop and sleep for 1000 years. This weekend, we at Bigface Studio have been shooting a charity calender for Claires Message, a campaign to lower age of cervical screening to 20 in the UK. 15 models, 7 hours, 3 workers. Despite the early rise and hard work it turned out to be one of the most rewarding days I have ever spent. Some of the stories I was exposed to were utterly shocking yet so inspirational! Needless to say, as soon as the day drew to a close I was straight on the phone to my GP arranging my first cervical screening. For those of you in the North of England, keep an eye out on Monday daytime and evenings ITV news for the full story. This weeks recipe was chosen by Hanaa of Hanaa’s Kitchen and is quite different from most of the other treats we’ve been baking up over the months. 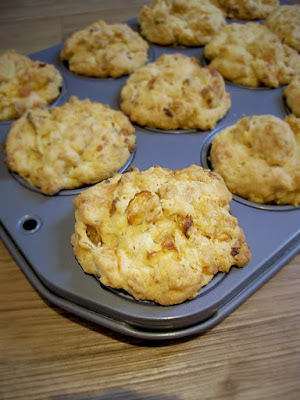 This week, we made caramelized onion, sage and cheddar muffins, that’s right, savory muffins! I’ve never had a savory muffin before so I was quite excited to try these out, even more so after the SMS girls were talking of their spicy kick. I altered the recipe quite a bit just to fit what I had on hand, I added chunks of feta cheese and rather than onions I used caramelized shallots. The muffins were a roaring success. I didn’t have very high hopes and convinced myself they would stick to the muffin try and fall apart when I tried to remove them but each and every one came out perfectly. I haven’t tried one yet as I have a pan of basil and tomato soup simmering away in the kitchen that is begging to be paired with these muffins. What a perfect supper for a chilly Autumn day. Check out the SMS girls for more muffins. Previous Post Go nuts for Donuts! I hope you get some rest soon. Your muffins look splendid. Im sure they will go perfectly with that tomato soup!Enjoy! wow you're look super nice! and yay for finally posting on sunday =]. these were great with soup! I have never tasted a savory muffin, but I see many uses for them. I would love a bacon and tomato savory muffin with my afternoon soup!! Your muffins look lovely! I think having them with soup is a perfect idea! The charity calendar sounds exciting and an event to be forever proud of. The hours sound long but I can only imagine the stories you heard and the project will be brought up on the news? What a great avenue to get the calendar and cervical screening awaareness brought to the forefront!You even fit the muffins in when you are so tired…the Feta cheese and shallots with the tomato and basil soup will be incredible together. There is a feeling of accomplishment to using ingredients on hand when do a baking event and everything turns out better then expected. Great JOB! They turned out great. I'm glad they didn't stick to the pan. Let us know how you liked them after your soup was done. Sounds like a great combo. I'll have to try your feta cheese sub. I love that stuff.Thanks for baking along with me this week! Your changes sound really good. Let us know how you liked them. Your muffins look wonderful and with tomato basil soup – yummy! !Your project at work sounds very interesting!! Your muffins look great, and the soup sounds so good. I love tomato soup. Nice twist on the ingredients. Sounds great! Your muffins look perfect. Look at those nice fluffy muffins, great work! Muffins and soup sound like the perfect comfort food after a long weekend, hope you enjoyed them! They look gorgeous! Now go get some sleep! They do look great, perfect with a nice bowl of soup! Oh, man I love feta! I will do that next time. Still too hot for soup here, but will make them again when the weather get a bit cooler. Glad they were a success. mmmm. tomato basil soup and these muffins… sounds like a winner! !